Hey, it’s me. So nice to be back, it has been too long. Although I have held up my New Year’s resolution, for the most part of baking/cooking something new each day, I clearly have not been keeping my blog up-to-date. And. I am afraid to inform you that for 31 days I will be taking a break from my resolution and turning my focus to a different challenge. 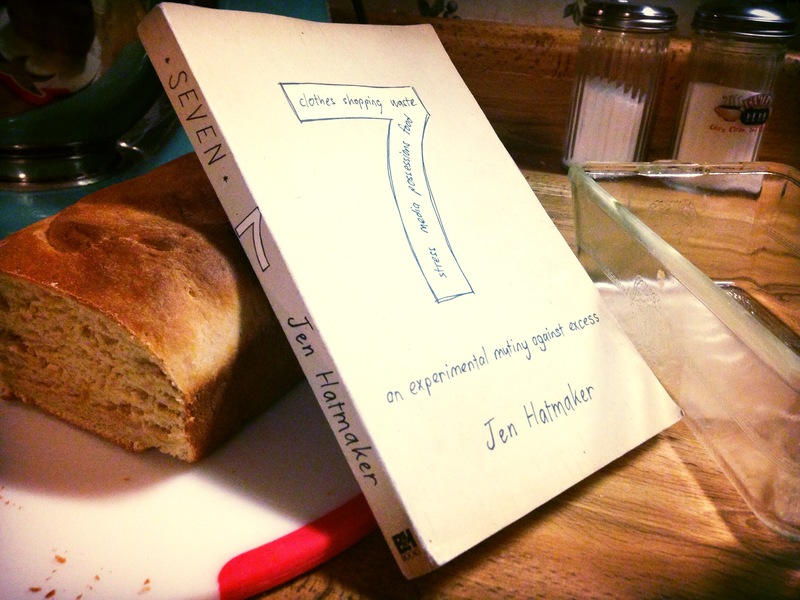 Recently, I have been reading this book, Seven, thanks to a good friend who encouraged me to read it. It’s all about getting rid of excess; specifically, in seven different areas the author chooses. The first chapter is food. Anyways, the author goes on a seven food fast, she only eats seven specific foods that she has picked for 31 days. Like I said, the whole goal is to eliminate things that you just do not need. I instantly felt a need to do this fast. I am in need of needing more of the Lord and less of things, less of me, less of food, less of possessions, less of this world. So, I’m challenging myself and doing this fast. I’m not doing it to go on a diet, I’m not doing it to “eat healthy”, I’m not doing it to fulfill the need of “always wanting to be doing something” (as I have already been accused… cough, cough Allison). I am simply doing this hoping and praying that the Lord will turn a heart that is hungry for Him into a heart that is full. I do not anticipate that this will be easy, but that is the whole point. I am radically changing one area of my life so that I can be challenged; and, so that I can be reminded daily, multiple times at that, to seek Him when I feel the need for excess. And, obviously I’ll be staying hydrated with water and 100% (no sugar added) fruit juices. I’ve never done a fast before, not like this. But, I figure if I seek less of my world and look more to His, then He will show me something. I’m not looking for an answer to anything or some big testimony to share with people, I’m just looking for Jesus. This is such a good recipe! I haven’t posted in a while because I kind of just got in a recipe slump. I wasn’t making stuff that was super yummy, with the exception of the carrot cake. Yellow cake is classic; particularly with chocolate frosting, but in any fashion really, it’s delicious. Therefore, when I found a recipe for classic yellow cake I decided I would give it a try. I know it’s nothing crazy or out of the box (well I mean that’s kind of the point… that it isn’t out of the box), which makes it unique. The order of mixing ingredients was a little different than I had seen before in cake batter recipes, it was more like how you would prepare cookie dough, but in the end it came together as a cake batter. A couple things I would do differently when baking cupcakes next time is: a) Cook the cake batter for about 3-4 minutes longer than the directions state; b) Don’t over-beat the cake batter. You’ll want to be sure and make sure the cake batter is smooth, but don’t like beat it on high or anything crazy. This will help the cake to be lighter & fluffier. Overall, this recipe was pretty good. I think I cooked the little cakes too long because they were a little dry… Next time I might add some sour cream or something to moisten them a bit. 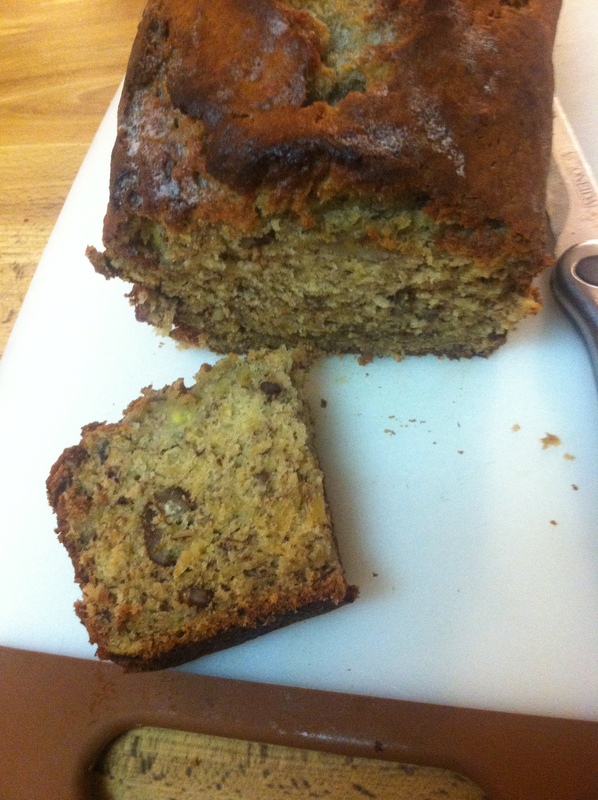 Days 17-19th: Black Magic Chocolate Cake, Creamy Hot Cocoa, & Banana Nut Bread. 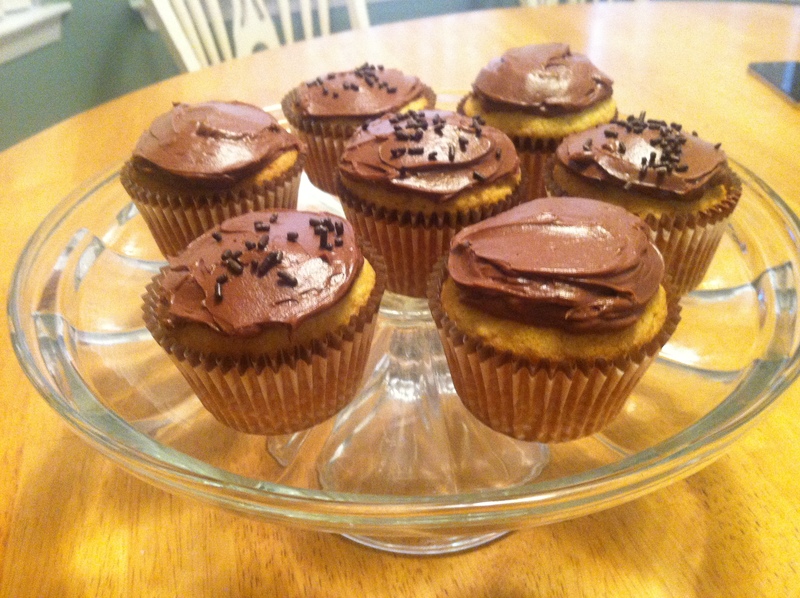 I’d like to start off by saying that although I have not blogged in 2 days, I have been baking new recipes. 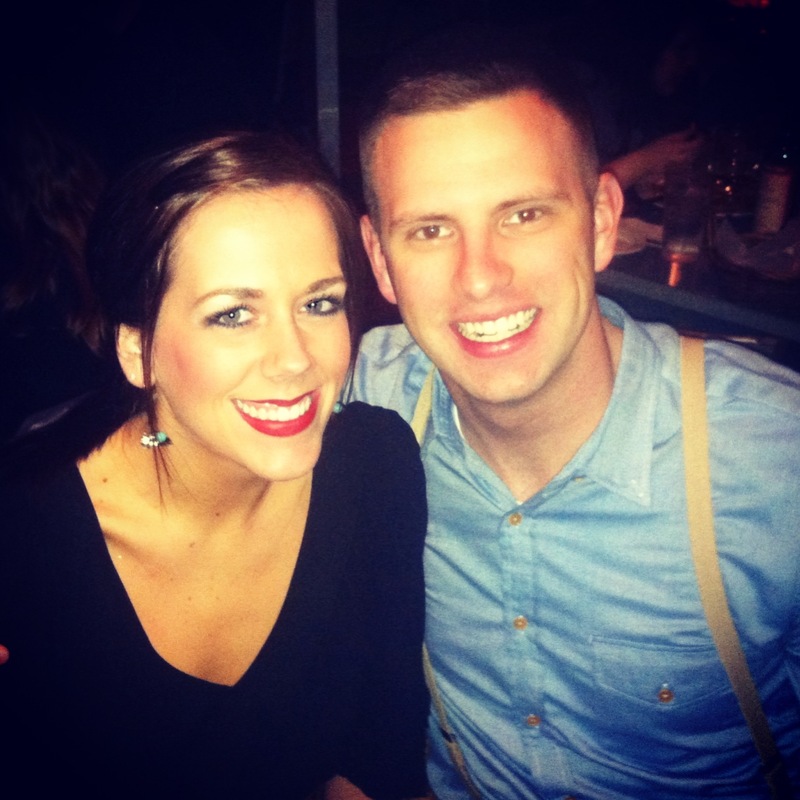 However, I have had a few distractions recently that have kept me from sitting down and writing my blog. Example A: The reason I didn’t blog on the 17th. I have had a visitor the past few days, so blogging wasn’t exactly at the top of my list of activities for us to do. 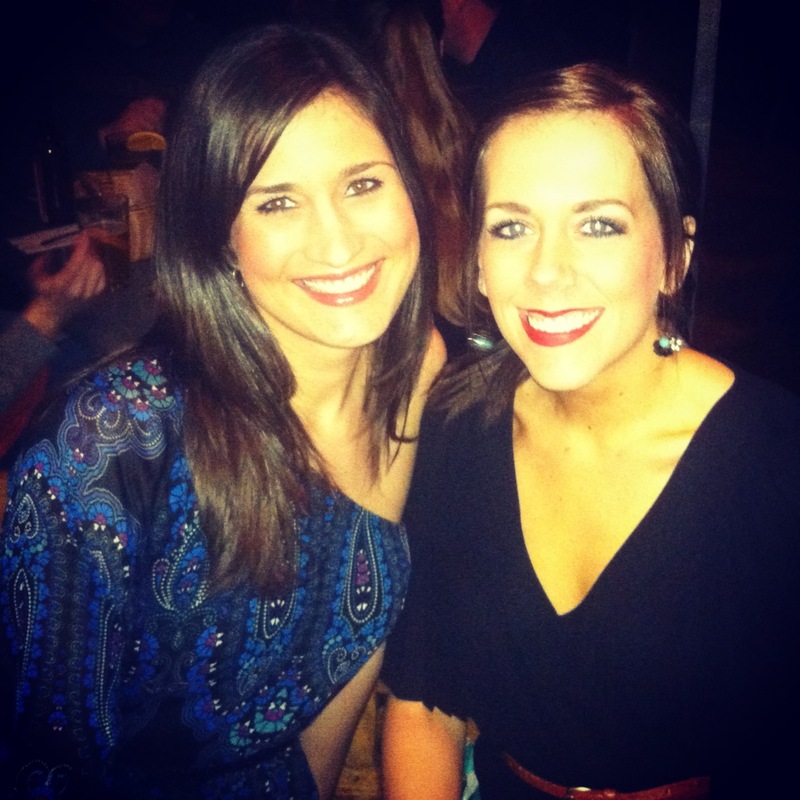 Instead we went to see a dear friend of mine and celebrate her quarter life Birthday. 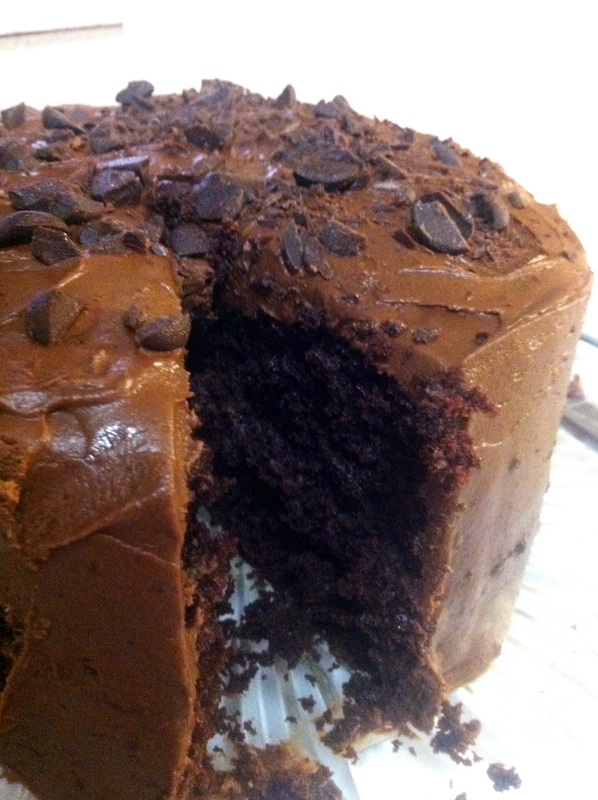 Although I did not blog, I did make a yummy cake for this day… Just couldn’t tell you yet because it was a surprise. Example B: The reason I didn’t blog on the 18th. Steph’s Black Magic Birthday Cake! 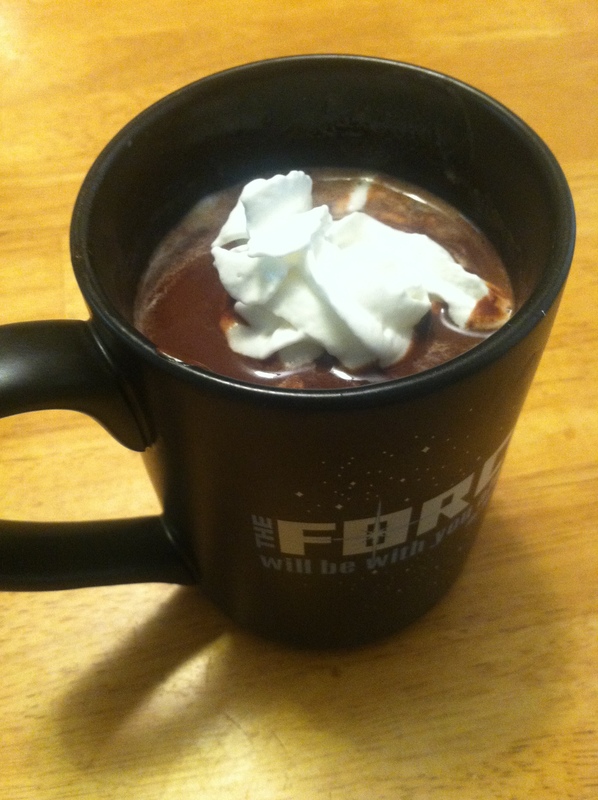 On Friday morning I made Cream Hot Cocoa using a Martha Stewart recipe. Literally all it was was milk, chocolate chips (I used bittersweet and milk chocolate chips), and vanilla. Super simple and suuuuuper rich. I forgot to take a picture before I devoured this dinner because I was so hungry, my apologies. I must confess, although I prepped everything, my mother actually dressed the veggies & chicken and got them in the oven because I was running around like a chicken with my head cut off this afternoon. 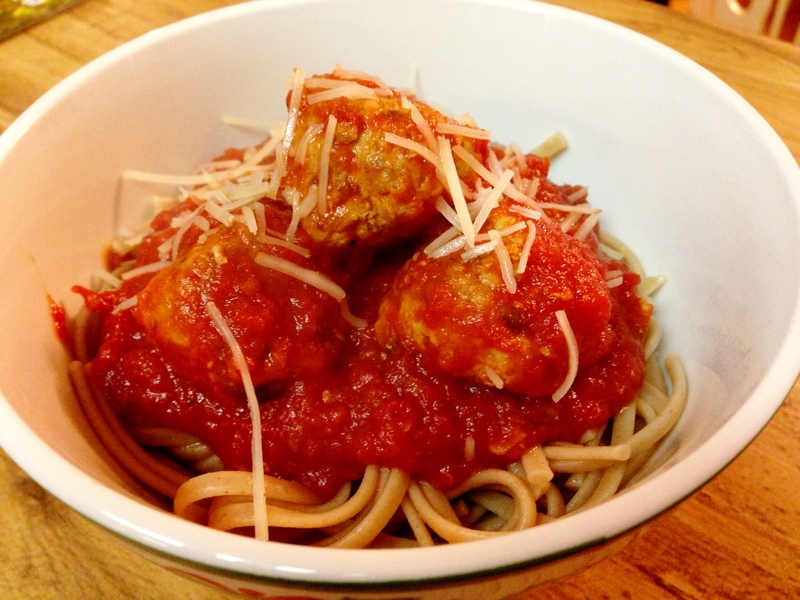 I thought this meal was very light, tasty, and easy to make. It was a little on the vinegary (Idk if that’s a word) side because of the Balsamic, but overall it had good flavor. You can tell I’m back in the swing of things and that school has started again because I don’t have as much time/energy to write long posts. However, the weekend is coming and good recipes are in the near future. Let me start off by saying: Sally (of www.SallysBakingAddiction.com), although we do not know each other, if we did I feel that we would be great baking friends. I have already used one of Sally’s recipes this year for Day 11 and absolutely loved it. 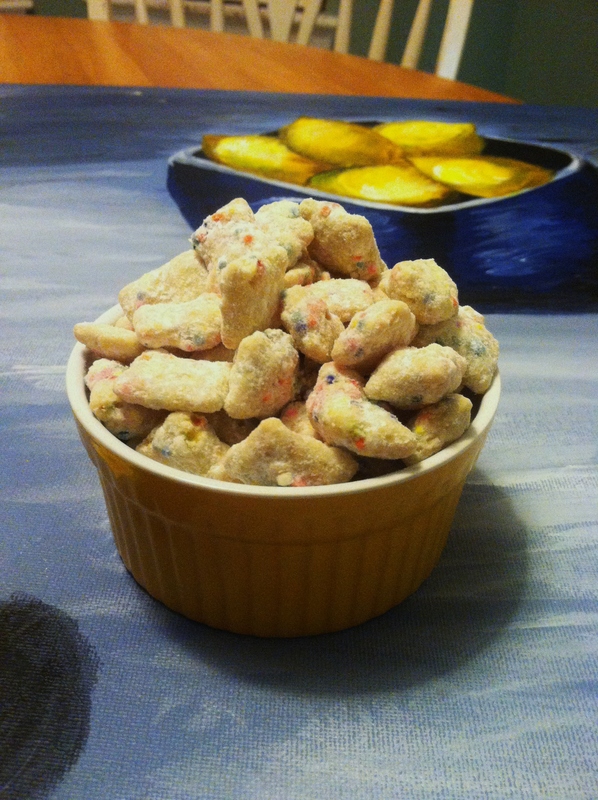 The same goes for this Cupcake Puppy Chow. I have made “birthday cake” puppy chow before with Funfetti cake mix, white chocolate, etc. ; however, this recipe really has the flavor of a cupcake in one little chex bite. It must be from Sally’s combination of the butter and almond extracts combined with the white chocolate. I did a painting class tonight at Panama City’s Visual Arts Center (Paint Your Art Out!) and sneakily put the puppy chow on top of my painting so I could show off my masterpiece. Aren’t the lemons just popping out at you?! Tonight I had chicken Marsala for the first time. 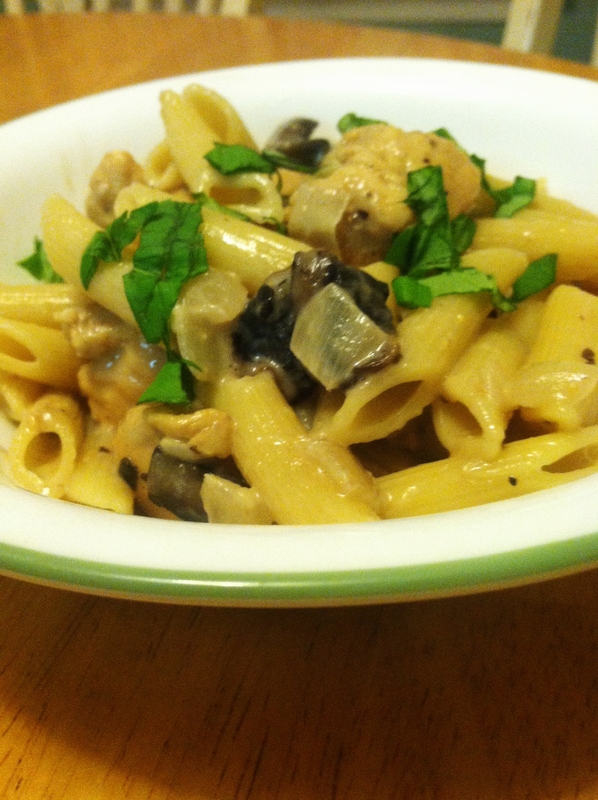 Well, a version of chicken Marsala. 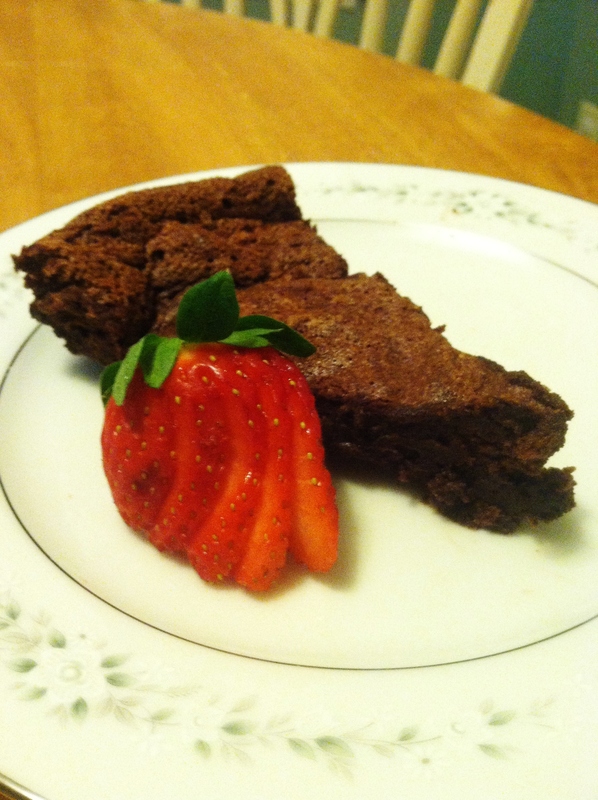 It was a bit too rich for my taste, but the other family members liked it… So they say. The recipe was easy to follow and I didn’t change anything when I made it. I got a little nervous when I was making the sauce for the pasta because it seemed like it was going to be too thin; however, when I added the sauce to the pasta and cook it for a few minutes longer, the pasta absorbed a lot of the sauce. That’s all for tonight, I hope you have a fabulous evening… Happy Monday (and glad it’s almost over)! That’s all for today’s recipe, but this week I plan to make a new chicken Marsala recipe, a smoothie, a cake, and maybe these spicy Thai tacos. So, stay tuned. 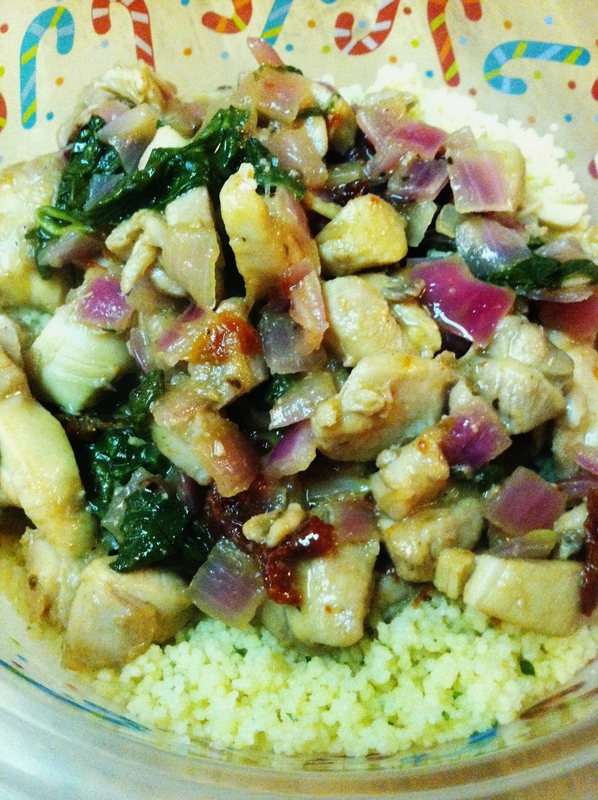 Today’s recipe was good and pretty easy. I didn’t get a good picture of the dish, like the original blogger, but it tasted yummy! One reason it didn’t look like the original blogger’s is because… I didn’t exactly follow the recipe. I thought I had red wine vinegar but I actually had white wine vinegar, so I have to improvise. It still tasted good, but I imagine it’d have been better and looked prettier had I done as I was instructed. And my pitiful picture. Pardon the candy cane Tupperware; I was making a to-go dish for my sister. Well folks, it’s Friday and that calls for……… sprinkles! I LOVE SPRINKLES. I’ve said it before and I’ll say it again. I love sprinkles. When I saw this recipe I could not turn away because this is straight up a party in a cookie and I knew it would be divine. 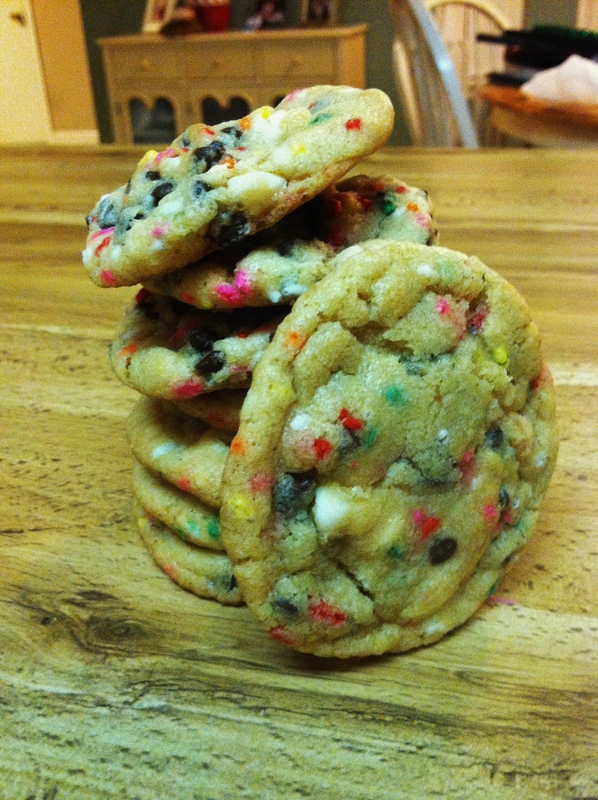 Cake batter, chocolate chips, sprinkles=perfection in a cookie. Shout out to http://www.SallysBakingAddiction.com because she provides detailed directions and pictures to make this yummy cookies. This is definitely my favorite recipe I have tested thus far.